This Tuesday I would like to tempt your taste buds with a little tale from the beginning of my culinary adventures on the Amalfi Coast. When I first arrived here two years ago, I have to admit I was quite nervous to start cooking for my boyfriend. There I was, a novice with Italian cooking, trying to find my way in this land of many traditions and make a good impression at the same time. Fortunately, I found a man who loves good food and loves to cook. Many of our first meals were cooked together, which is a tradition I love that we have maintained. Yet it wasn’t long before the wonderful cooking here inspired me to be a bit more adventurous in the kitchen. I wanted to know how to make my own zuppa di fagioli e scarola (bean and escarole soup) and I wanted to know how to prepare those delicious looking melanzane (eggplant) and funghi (mushrooms) I saw at the market. At just the right time, my Mom came to the rescue (grazie Mom!) 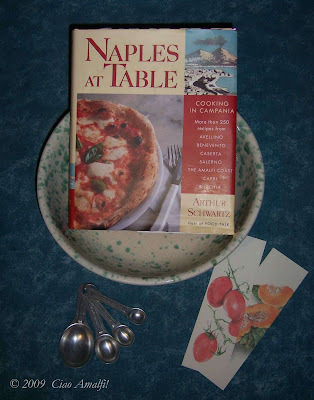 by buying me a copy of Arthur Schwartz’s cookbook Naples at Table: Cooking in Campania. I didn’t take me long to realize just how good this cookbook was, and it very quickly became my cooking bible. I have learned so much from this book, and I can say it is spot on about many of the cooking methods and traditions here in Campania. (Although with certain dishes there are, of course, many different ways to prepare them.) Schwartz clearly did his research, as many of his dishes are prepared exactly how I have learned to cook them here from family and friends. Schwartz does an excellent job capturing the simplicity of many typical dishes here, such as Spaghetti con tonno sott’olio (Spaghetti with canned tuna) and Linguine all’Amalfitana (Linguine with walnuts and anchovies). These dishes are simple and take no longer to make than it takes to boil your water for pasta. Quick and easy and delicious, these dishes will quickly become standards in your home! I will never forget how this book helped me prepare meals that shocked my boyfriend at first. He would ask, “How did you know how to make this exactly how we make it here?” My little secret! Over the last two years, I have met several of the people that Schwartz talked to and gathered recipes from, and I have enjoying trying my own hand at making recipes from some of the best cooks on the Amalfi Coast and in Campania. In addition to being a great cookbook, Naples at Table is also a real pleasure to read. Schwartz has an in depth knowledge of the cooking traditions and history of Campania, and he shares it in interesting tidbits throughout the cookbook. This book has taught me so much over the past two years, and I would highly recommend it to those of you interested in learning about the fabulous cooking here in Campania. It is temporarily out of stock at Amazon, so check with your local bookseller. 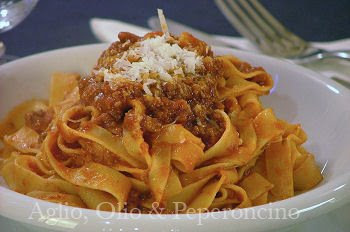 You can read more about Naples at Table over at Food Maven and South of Rome. Do you use this cookbook? What do you think? 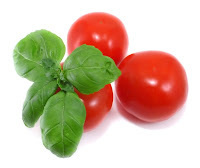 The Italians are famous for their many traditions centered around food. A wonderful part of my last two years in Italy has been discovering and attempting to prepare the traditional meals and desserts that seem to come with every holiday. Food traditions here are not only centered around the holidays though, and it is these everyday traditions that I have grown to love the most. By far my favorite tradition here in Italy is the Sunday lunch with family. A good meal, time to catch up with the family, to laugh and relax, all finished off, of course, by some type of tempting dessert. I love being out and about late on a Sunday morning and seeing people hurrying to their lunch destinations carrying bundles of pastries, delicately stacked on trays and carefully wrapped in paper and ribbons by the local bakeries. I can just imagine the moment after a wonderful lunch when each bundle will be unwrapped to the happy sounds and eager eyes of the family and friends around the table. Last Sunday I was reminded of all of this when I read a beautiful post by the ever so talented Lola of Aglio, Olio & Peperoncino called Sundays spent satiating. If the photo above has your mouth watering, head over to read about Lola’s Sunday lunches with her family and learn how to prepare her mother’s Tagliatelle al Ragù. If you didn’t already have plans for lunch today, now you do! It is not a complicated dish to prepare, and it is one that rewards you with all the time and love you put into it. For me this is the quintessential Sunday pasta, and I have noticed I start craving it on Saturday nights, already with the thoughts of Sunday lunch seeping into my mind. Just a week ago I found Lola’s blog Aglio, Olio & Peperoncino, and since then I have been enjoying her interesting, funny and beautiful posts. I have been wondering for awhile now how to prepare Fried Zucchini Blossoms, because I kept hearing just how good they are. With Lola’s recipe, I learned that it really isn’t all that difficult. I also learned that although her home is in Rome, she has a deep connection with the Amalfi Coast. Having practically grown up in Positano, as she described it, she knows the Coast and the food traditions here very well. In fact, when I see the name of her blog, I can’t help but think of the three most important cooking ingredients here… aglio, olio & peperoncino! Lola has recently launched a new blog called Forchettine, where she continues to share her food expertise in the form of restaurant reviews. 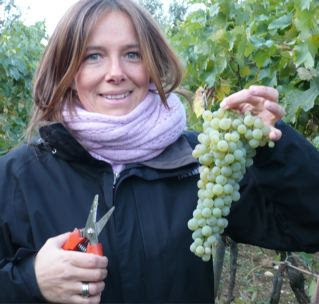 Last week she wrote a review of the restaurant Da Teresa located at the Santa Croce beach near Amalfi. Santa Croce is by far my favorite beach on the Amalfi Coast, and have have so many happy memories of enjoying lunch and vino bianco with fresh peaches from Da Teresa while soaking up the sun. Forchettine is written in Italian (I told you Lola was ever so talented!) for those of you who also read Italian, or those of you learning (like me!) who are looking for some enjoyable reading practice. 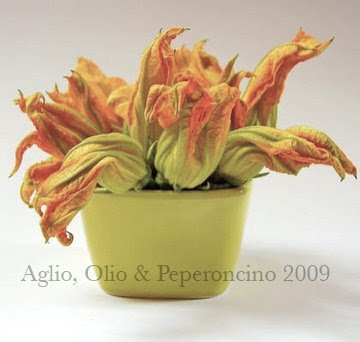 I give a four fork rating to Lola’s excellent blogs Aglio, Olio & Peperoncino and Forchettine! The first signs of summer traffic are starting to arrive on the Amalfi Coast. More and more buses arrive each day, which means the return of the inevitable mini traffic jams. 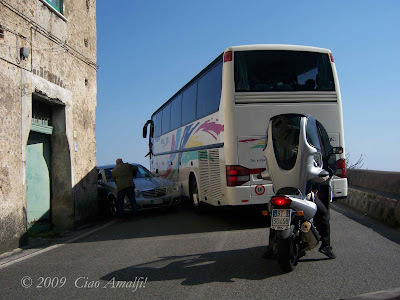 The one above was caused by a poor tourist who had decided to rent a lovely Mercedes for a day on the Amalfi Coast. In this moment, however, he was about to add some not so lovely scratches down both sides of his rental car by trying to squeeze through too small of a space between the bus and the wall. Some guidance from a friendly local helped him back out of the tight spot and make way for the bus to get through. The locals deal very well with the bus traffic here generally, but I can’t blame the tourists who decide to drive here for not knowing what to do. I just feel sorry for them as they grimace and flinch their way along the Amalfi Coast, because they don’t have time to enjoy the beautiful views along the way. Update on the my driving lessons: Yesterday we found a very small parking area that was level where I could practice. I think I might get the hang of this eventually! 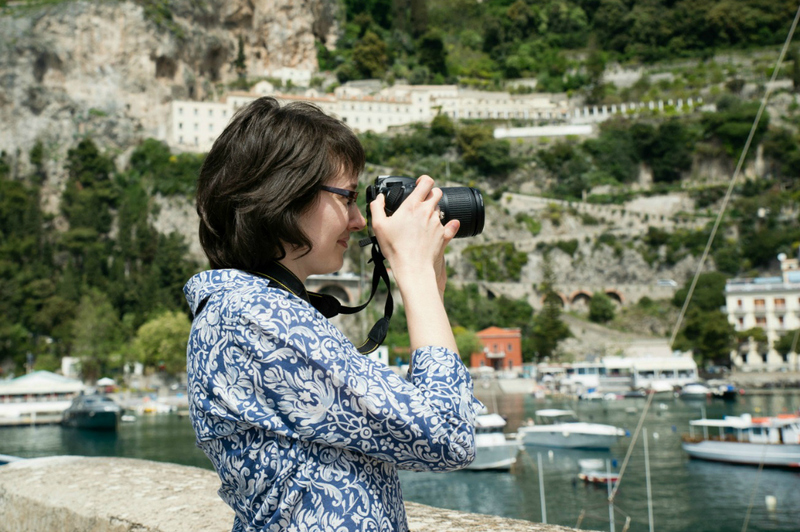 Thanks to everyone who commented and shared their driving stories on the Amalfi Coast. It is great to know I am not alone in this driving adventure! They say driving in Italy is an adventure. They say the Amalfi Coast road, with all its curves, impossibly narrow stretches and crazy drivers, is even more of an adventure. But what those people didn’t say is that learning to drive a manual transmission car for the first time in Italy and on the Amalfi Coast is something more than an adventure. Start by thinking action adventure, set it in a small town, add a few donkeys, tourist buses, and a couple of perplexed old men sitting on a wall, and you will have a mental image of my first driving lesson in Italy. Sigh. This is going to take awhile. What I found most frustrating is that I could go so quickly from being the person who was a very good driver for eleven years to the person who suddenly felt so helpless behind the wheel. As I struggled to find the right balance between la frizione (the clutch) and the pedale dell’acceleratore (you guessed it! ), I couldn’t help but wonder why driving has to be so difficult. But difficult or not, manual transmission cars are the standard here in Italy, and I do intend to be that good driver again. Like I said, it is just going to take awhile. While the parking lot I dream of is nonexistent here, we have found a couple of stretches of road on the way home that are relatively straight (only three or four curves!) and not too steep, so those are my practicing grounds now. I know at the end of this driving adventure I will feel confident driving just about anywhere in the world. For the time being, perhaps I will just stick to the virtual driving on Google Maps! What are your best driving adventures in Italy? Are you planning on driving on your next trip to Italy? It is very easy, quick and affordable to get an International Driving Permit from your local AAA or through the mail. I also hear it is possible to rent automatic transmission cars here for those of you that share the same driving disadvantage as me! Take a Virtual Drive on the Amalfi Coast! This morning I was very happy to read over at Bell’Avventura that Google Maps street view has come to the Amalfi Coast. And they picked a lovely, sunny day to make their visit! You can click along the white arrows to take a virtual drive along the Amalfi Coast and do a 360 wherever you stop. How fun! My first stop was the Piazza Duomo in Amalfi, where the map above begins. (You can move around by clicking the image right in this post, or head over to the Google Maps site to have a better view.) I had so much fun poking around and seeing people I recognized in Amalfi’s main piazza before taking a tour around Piazza Flavio Gioia. 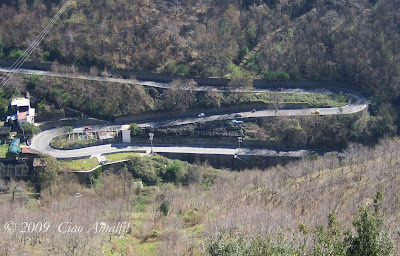 You can follow the road both directions out of Amalfi, either toward Atrani or toward Positano. I followed the road virtually to my front door. Well, about 60 or so steps from my front door! No sign of the car. It made me wonder where I was and what I was doing on this day? Buon divertimento! Have fun!